COUNCIL’S CROSSROADS. The Philippines hosts this year’s Asia Water Council, with problems and solutions to the region’s water issues, which include the water crisis since last week in Metro Manila, on the delegates’ clipboards. 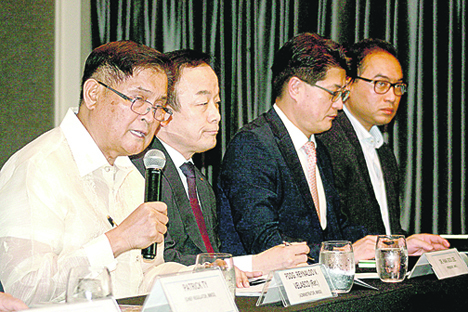 Held at the Makati Diamond Residences with (from left) MWSS Administrator Reynaldo Velasco, Dr. Yongdeok Cho and Ferdinand dela Cruz, president and CEO of Manila Water Company. “We will comply with the marching orders of President Rodrigo Duterte to solve the water shortage in 150 days and the Metropolitan Waterworks and Sewerage System together with its concessionaires—Manila Water, Maynilad and Bulacan Bulk Water will do [their] best to meet [the President’s] expectations,” MWSS Administrator Reynaldo Velasco said in a statement. Velasco’s statement followed his earlier clarification that “there’s no such thing as 150 days” worth of water from Angat Dam. Duterte earlier ordered 150 days’ worth of water to be released to supply water to those affected by the water shortage. “We perfectly understand the presidential order to immediately resolve the problem to ease the burden of the consuming public,” Velasco said. “In line with his order, the MWSS, through the approval of the Natural Water Resources Board [NWRB], has actually added 2 cm to the 46 cm released daily from [the] Angat-Ipo-La Mesa water systems, which can only accommodate 4,000 million liters daily,” he noted. Angat Dam supplies Metro Manila with 4,000 million liters of water per day. The concession agreements gave Manila Water an allocation of 1,600 MLD for its 6 million consumers and Maynilad with 2,400 MLD for its 9 million consumers. That is a total 4,000 MLD, divided into 40 percent and 60 percent, respectively, which is based on the actual volume that Angat can give with the existing infrastructure involving aqueducts and pipeline systems. Velasco said Manila Water was getting its allocation of 1,600 MLD but its requirement was now pegged at 1,750 MLD due to the increase in demand, consumption and population growth. “The present problem could have been averted had Manila Water’s 100 MLD Cardona Treatment Plant had been operational since December 2018,” he said. In the previous months, Velasco said, Manila Water has been sourcing its deficit water from La Mesa Dam but due to the lack of rains caused by the El Niño or dry spell, La Mesa Dam was depleted. The MWSS has directed Manila Water to activate and operationalize its Cardona, Rizal treatment plant, enough to provide an additional 100 MLD to its consumers. Manila Water president Ferdinand dela Cruz on Saturday announced that the Cardona Treatment Plant was now energized with an initial 24 MLD and would be fully-operational with 50 MLD by the end of this month. “We wish to assure the President that MWSS is doing its best to solve the water shortage problem and we are putting to task Manila Water to give us a definitive timeline of solving their distribution and operations systems to bring back to normal level the water supply to ease the suffering of the consuming public,” Velasco said. He also reiterated that short- and long-term solutions for Metro Manila’s water supply demand were now in place and on pace, under the Duterte administration to provide sufficient water to supply the future needs of the 20 million residents in the metropolis and nearby provinces serviced by its three concessionaires in the next 10 to 15 years. “Admittedly, we are on a catch-up mode as far as water supply source is concerned since our main source, which is the Angat Dam that supplies 96 percent of water to Metro Manila and the provinces of Bulacan, Cavite and Rizal, was built in 1967 and no major water source has been built since then, except for some water supply projects from Laguna Lake by both Maynilad and Manila Water,” Velasco said. He said it was only over the past two years under the Duterte administration that serious efforts have been put in place to push for major water flagship projects, such as the 600-MLD Kaliwa Dam, 500 MLD from Wawa Dam, 800 MLD to be sourced from unutilized water from Angat-Norzagaray, 350 MLD from Bayabas Dam, as well as 500 MLD from Laguna Lake. Meanwhile, Velasco clarified that the so-called “bypass” had been open all along, following a viral post on social media involving MWSS chief regulator Patrick Ty and a netizen. According to MWSS, the bypass was opened regularly, particularly because the La Mesa Dam level was low. Most, if not all, of Manila Water’s 1600 MLD now probably was going through the bypass. Last year, Manila Water and Maynilad had issues regarding the bypass that resulted in MWSS mediating between the two concessionaires after Maynilad complained that it was getting less than 60 percent, causing its Bagbag Reservoir’s level to fall, and affecting its service area. Contrary to perceptions, Velasco said, the 60-40 split was not maintained throughout the day. “Maynilad produces more at night because it has the Bagbag reservoir to fill up and use during the day. While Manila Water produces more during the daytime. It is the Common Purpose Facilities that controls the bypass that regulates this sharing,” he noted. Meanwhile, a party-list lawmaker called on the Department of Agriculture to provide emergency aid to farmers heavily hit by drought. Party-list Rep. Ariel Casilao of Anakpawis said that so far, the government had estimated the damage wrought by the drought at P1.2 billion worth of crops in nine provinces in the Visayas and Mindanao major islands. The Agriculture department earlier announced that about 22 provinces were expected to be affected by drought, including Palawan, Ilocos Sur, and La Union. “While the government is receiving reports of areas where farmers are grossly decapacitated on saving their crops, the urgent concern at present is for them to be assisted, alleviated with government aid. Otherwise, they will certainly fall into unrecoverable bankruptcy and consequently, our local food supply and sufficiency will decline,” Casilao said. He said regional chapters of Kilusang Magbubukid ng Pilipinas reported that farmers in the provinces were in dire need of food and cash assistance and irrigation services to salvage crops which are not totally destroyed. Government agencies and local governments reported damages in Cotabato at P362 million on rice, P269 million on corn crops; Kidapawan at P53 million; Maguindanao at P47 million on rice, P54 million on corn; Zamboanga provinces at P79 million; Davao del Sur at P55 million; Misamis Oriental at P7 million; Pagadian City at P102 million and P23 million on high-value crops and seaweeds; in Negros Oriental at P6.1 million; and Region IV-B Mimaropa on 3,000 hectares of cropland. “We believe the damage could not be this worse if the Free Irrigation Services Act were fully implemented, we intend to know if these lands should have been saved by free irrigation,” Casilao said. Republic Act 10969 or the Free Irrigation Services Act was enacted on Feb. 2 last year but is yet to be implemented as its implementing rules and regulations is yet to be finalized, after more than a year, he lamented. “The Rice Liberalization Act has overran the Free Irrigation Act, and now the farmers are hammered by the drought, that neoliberals will use to their argument that local agriculture is a lost cause and the government’s token measures and downplaying of damages are reeking of its adoption of liberalization or non-intervention dogma,” he said. The lawmaker said that the value of damaged crops is of serious level as it represented the lost potential incomes of farmers and wealth that could have circulated to the local economy.